The computer keyboard has been getting a good workout, too! It's beginning to come together! So exciting!! Star Spangled Liberty begins this August at a quilt shop near you! I'm deep into writing and stitching for my Star Spangled Liberty BOM program (making both quilts at the same time and loving it!!) so I don't have a lot to talk about that's new from Heartspun Quilts at the moment, but wanted to share something positive that I enjoy everyday. Each day, whether it be in our own personal lives, on the news, or at work, there doesn't seem to be an end to the bad news and negativity thrown at us on a daily basis. It can bum a girl out! I wanted to share a wonderful, positive force that comes to my inbox daily...free of charge. The Brave Girls Club is by women, for women, and is nothing but positive, warm and fuzzy reminders of goodness and kindness. I subscribe to their daily emails and often....some of them really speak to me! I have printed some of the messages and pinned them to by bulletin board to remind myself of a particular message I need to remember. Perhaps the Brave Girls Club is not for everyone, but I think there are a lot of you who would sincerely enjoy it as much as I do. It's positive, it's free, and it's uplifting. It's so nice to know that there are people out there who are powered by the positive just like you and me. Click here to sign up for their daily emails. Just wanted to pass along something good to all of my many friends around the world. With the miracle of Spring happening all around us in the budding trees and flowers, it's a good thing to also encourage happiness and renewal within our mind, heart and souls. Celebrate National Quilting Day with a SALE!!! I thought National Quilting Day was the 16th. Nope....it's not until Saturday, the 19th. No biggie...let's just celebrate the rest of the week. Sound like a plan? Sure, why not! In celebration, I am having a sale on all of my fabrics!! 20 to 25% off on all my fabric offerings and discounts on postage, too!! Lots and lots of assorted Fat Quarter and Fat Eighth bundles are on sale! You'll find an assortment of quilt kits on sale as well. Go forth and surf....your stash needs to be fed!! My thanks to everyone...all 300+ of you, whom took the time to comment for a chance to receive a small box of my scraps. I read each and every comment, and honestly can't tell you how much I thoroughly enjoyed reading each one! As I was reading, I wished that I had a box to send to everyone, and while I accumulated a lot of scraps, I don't have that many!! Your scraps are perfect for my project! I use Bonnie Hunter's scrap saving system pretty much with a couple additions that come from using my accuquilt dies. I have one drawer called "bits" they are pretty small less than 1 1/2" side for doing miniature or doing string piecing to make a larger piece. Thanks for sharing your scrap bin with us! I haven't been quilting very long, so right now it works for me to save most of my scraps by the project that created them. I seem to know where to look for them better that way. I can imagine that, as my scrap collection grows, I'll need to find another way. I have saved scraps as small as 1 inch squares on up. The boxes in your photos look very useful. I'm not working on a scrap project at the moment but have several patterns waiting for more scraps. Your scraps would really give my scrap collection a much needed boost! Thanks so much! when I first began piecing. That way, I could sort and file my scraps for use later, and find them easily when I needed them for that new project. The one bad thing about making scrappy quilts is how labor intensive they are. Worth it, for sure, but if you can cut down on the amount of time it takes to choose and prep the scraps, and get to sewing, it would be a big help! Just sayin'......so take it for what it's worth out there. Did you know that Wednesday, March 16th is National Quilting Day? 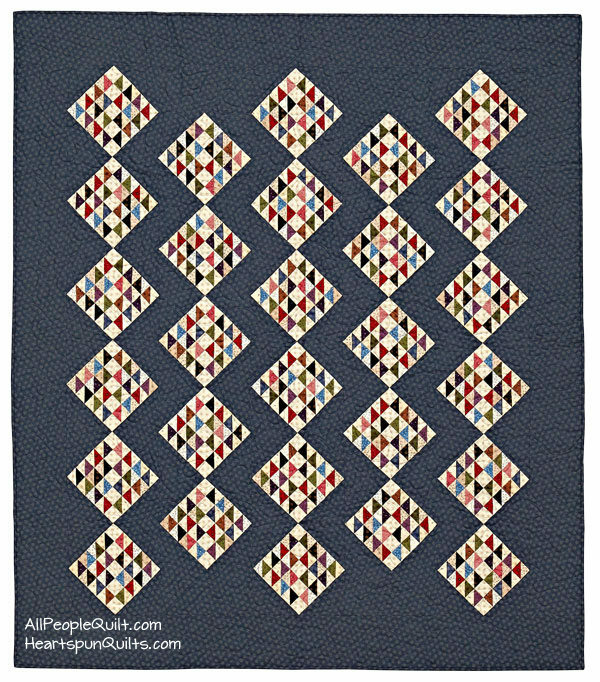 Be sure to check my blog post Wednesday morning for a special limited-time offer in celebration of National Quilting Day. Now, I'm headed back to work at the sewing machine (JOY) piecing blocks for Star Spangled Liberty. I will definitely post some block photos on Instagram and Facebook later today as well. Hope you get some time to sew today, too! Star Spangled Liberty ~ My New BOM!!! I've had just the best time designing the quilt and all the fabrics for my second BOM program. With all the excitement going on in our nation right now with the upcoming election (good, bad and the crazy! ), we're all in tune to setting our country on a new course, showing our red, white and blue pride everywhere. So, doing what quilters always do during a time like this, we turn to needle and thread to express our feelings. 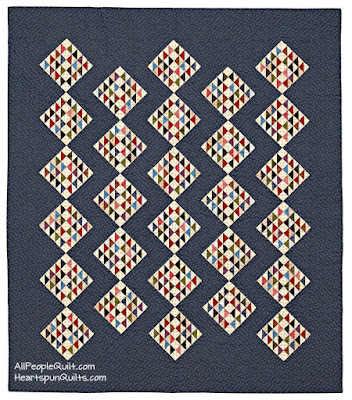 For those of you for whom applique is a four-letter word, I created an all pieced version of the quilt. When you sign up for the program, you'll simply choose which version you'd like to make! Easy, breezy! Both quilts measure approximately 74 1/2" x 78"
As designers of fabric, quilts and other fun to sew projects, we work months and sometimes more than a year in advance of when you actually get to see what we've been working on. This quilt was one of those that I've been working on for almost two years. I designed the quilt with the row concept long before the row by row programs that are running now became popular, so I'm delighted that they've been well received. When I was thinking about creating the quilt, I knew I wanted a new and completely different quilter's flag, and I am very jazzed about the flag in this quilt. I turned it vertically to offset all the rows of stars, which was the second element I really wanted in the quilt. We all love stars, don't we, and so I wanted lots and lots of star blocks. The center row really gave me a place to have fun with creating other patriotic blocks, and there I wanted to create blocks you might find at a Fourth of July parade. The flag star blocks and patriotic pinwheels fit the bill perfectly, and we see God Bless America banners on parade floats, too. This will be a 9 month BOM program, available only through participating quilt shops, so please be sure to ask your favorite quilt shop owner to offer the program. If you don't ask, they don't know you're interested! You'll begin to see a poster in quilt shops offering the program very soon, and the program actually begins in September, 2016. It was timed this way so you will be completing your quilt in May of 2017, just in time for Memorial day, July 4th, and to display all summer long!! I can't resist the opportunity to include some history in my BOM programs, so you can look forward to reading about Betsy Ross, who played an epic role in the birth of our nation. It truly warms my heart knowing how fabric, needle and thread in the hands of a skilled needlewoman such as Betsy, had such a profound and lasting impact on our nation, and the world. In every century since her first colonial flag was completed, "Old Glory" is recognized everywhere, by everyone! I will also have fun Old Glory flag facts (a nod to Sheldon Cooper! ), The Star Spangled Banner, and Pledge of Allegiance. Oh, and there will be a bonus project, too. To say my patriotic fabrics revved my design engine into overdrive would be a gross understatement!! 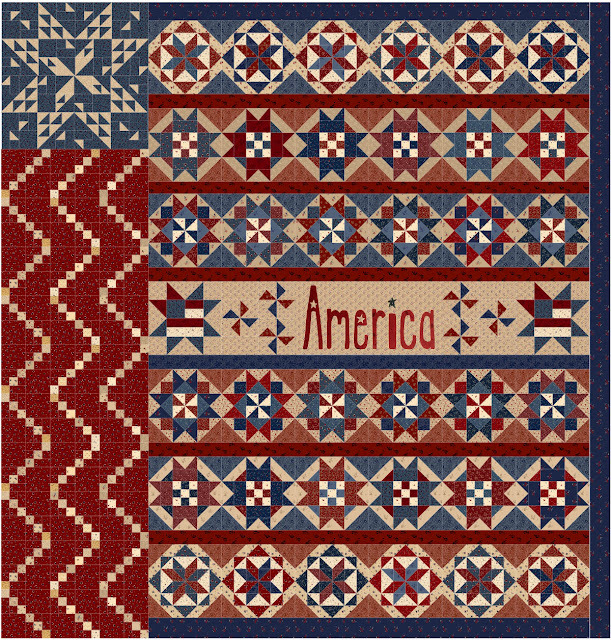 You can look forward to a brand new trio of Tokens of the Past quilts in a new pattern called Union Forever, once again made from the Star Spangled Liberty 10 inch precut pack. AND....a new patriotic Pocket Patchwork Sew-Along in the near future. Next thing for you to do is to click here to check out all of the delicious fabrics I designed for the Star Spangled Liberty collection. Oh, and while you're browsing the Marcus Fabrics website, do browse around the many other new fabric collections coming to your local quilt shop very soon. 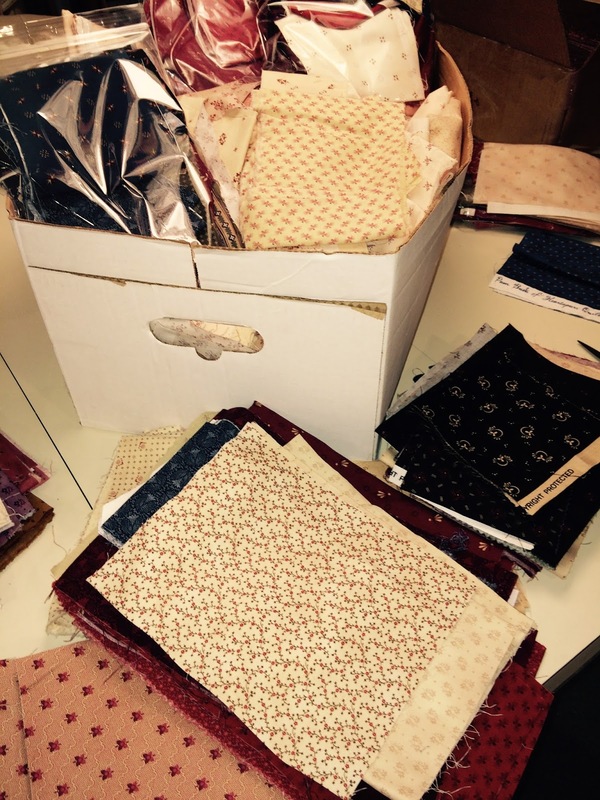 We have been hard at work to bring you new fabrics for your next quilt, or just to keep your stash happy! I invite you to keep visiting my blog for more news about my Star Spangled Liberty fabrics, and BOM program. Now that it has all been introduced, I can begin to post pictures of everything. Presently, I am piecing the quilts, so watch my Instagram and Facebook pages for sneak peeks of the quilt construction. Like Betsy, I hope you find some time to feed your soul with the stitches you sew. Thanks so much for reading my blog. I'd be awful lonely without you! We've been cutting a lot of kits and bundles lately, and along with the quilts we made using my latest fabric collection, Old Green Calicos, I've once again acquired a whole lotta scraps! Time to send them to a good home! 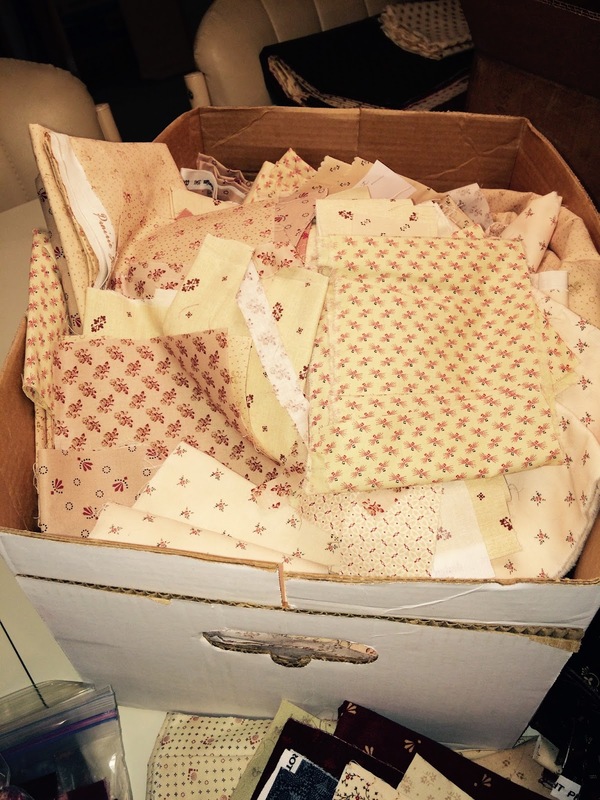 If you'd like to receive a bunch of my fabric scraps, just leave me a comment on my blog! I'd love to know how you sort, store and use your scraps. How many scrap quilt projects do you have going right now? What's the smallest size scrap you save? Let's talk scraps!! I'll be collecting your comments until Sunday evening, and on Monday, will post where those scraps are going. To be fair to everyone, I can only choose from comments left on my blog. Thanks, everybody, for helping me to make room for more scraps. Spread the word among your friends. I've had more than a few people email me wanting information about the bins I'm using for my Half Square Triangles and squares. I purchased both from JoAnn Fabrics. The bin on the left is made by Art Bin, which is a brand of organizer they carry all the time. I don't often see the one with all the dividers, though, so you may need to watch for that one, or check their on-line offernings. The small bin to the right with the blue dividers, also from JoAnn, is called Snapware. I've also purchased it at Walmart and Target. As we all know, scrap quilts are super labor intensive, but oh so glorious. I find that keeping my scraps sorted by color helps me to quickly find what I'm looking for. I'm sure interested in reading your scrap organizing ideas! I'm off to sew blocks for my new BOM, and I'll have a lot of news to share with you all about the BOM on Monday.